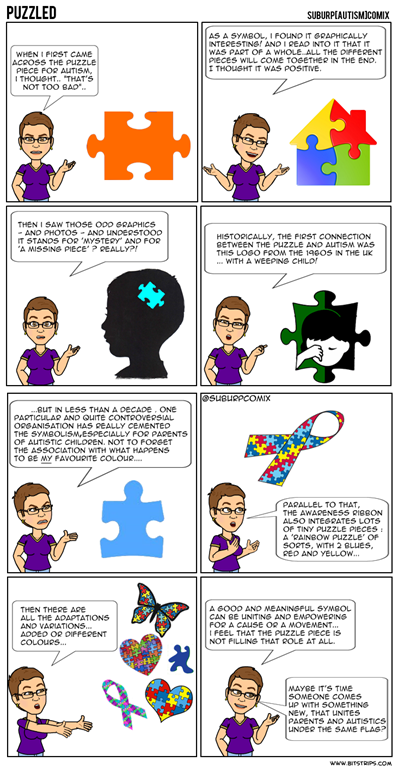 The puzzle piece – symbol for Autism ? I have really changed my mind about the puzzle piece since I first saw it in the context of Autism. I have read a few posts by autistic adults that clearly reject the symbolism. Read Autisticook’s post HERE, or other voices here, or here, for example. It may be too late to throw it overboard for this generation, but if opinions of the autistic bloggers are anything to go by, our children may grow up resenting that we allowed to stick a symbol on them that reflects our NT view of deficiency, of mystery and problem to solve with regards to autism. The fact that others rather see diversity, uniqueness and the rainbow colours of the autism spectrum just makes it more obvious how ambiguous and puzzling (!) the graphic actually is. So, I don’t know… Are there other graphics around that are more straightforward and positive ? Should we create one ? Or does it even matter? Do other conditions have a universal symbol like this, that goes beyond the colour of a ribbon or the graphic of one organisation? I would love to hear what you think! This entry was posted in autism, general, parenting, Sh*t people say about autism and tagged ASD, asperger's, aspie, aspies, autism, autism blogger, autism self-advocates, autism speaks, autism symbol, symbols, tattoos on December 15, 2013 by starfish. I am autistic, an author, and have lived a very sad, deprived life because people would rather throw money at eliminating us than accommodating us. So I will say this much: the puzzle piece is sufficient to induce the PTSD symptoms I suffer from. Other things relating to autism that cause me to PTSD-Hulk-out include but are not limited to referring to autism as if it is a separate thing to the autistic person (“has autism”, “with autism”, “suffer from autism”). Autism Speaks (I add “for normie a__holes” to their name as a shortcut, usually) are in a unique position amongst charities. No matter what they say (and when you look at their website, play “count the ‘with autism’s”), it is wrong. If they were to turn around and say that they wanted what I want, to be helped to find suitable living arrangements and work on the dime of a government that spent the entirety of my childhood funding my abuse as an example, they would not be Autism Speaks anymore. They would be an entirely different organisation that people would urge to use a different name because the name Autism Speaks is fundamentally a hate group. I defy anyone to look at the way Suzanne Wright speaks about autistic people (for example wanting to see a day when autism is only read about in history books) and tell me different. I am also planning to have a “logo” design made to put in one of my novels. Given that this symbol is going to basically represent Spirit-Wielders in my novels, it would be far more in-line with representing autistic people. Let me know if you want to see what I come up with when I am readying the novel to be published. Cheers. I share your view on Autism shrieks although luckily in Australia their exposure is limited at this point. But I do fear for the reactions of my son when he will come across their damaging rhetoric. I have hope though, that voices like yours, and I include here explicitly all ‘angry adult autistics’ are more and more heard. As a parent to an autistic boy I welcome the input of autistics an d I count on you to be the support group my son will need when he is older. WEll, i do NOT believe that. Hence my comic..? I’ve only recently discovered the unrest about the puzzle piece. I understand the worry that it signifies something puzzling, but that really had never occurred to me before. I have always seen it as symbolizing unique individuals who fit perfectly into the larger “puzzle” of society. Rather than something puzzling, I saw it as something which makes perfect sense. I suppose that’s semiotics for you- very open to interpretation! As I show in the comic, at first I also saw the puzzle as a positive symbol. But the terminology used around it by most who use it (and especially Autism Speaks) is very negative and I understand and accept the rejection by most autistic adults. That’s why I will not use it. The Cross of the Bastion was designed for people on the spectrum, while the Mark of Understanding was used to denote caregivers, teachers, etc. who were aware of autism and Asperger’s. Interesting. Both symbols and the wording has a lot of connotations of (mediaeval?) knightdom or crusade .. Is that intentional? The idea behind the Bastion was that of protection and strength, so I used that sort of medieval imagery for it. I created it when I talked to people around school about previous attempts to form student unions and the difficulty they had doing so. I thought “Ok, what do we really want?” and I came to the conclusion that it was a safe haven and a sense of unity and strength. I also wanted to create something that would appeal to college age folks, at least in its initial form. I don’t feel offended but do you realise you do not mention parents as a target group at all? I mean of course we are basically carers but I noticed that and others would too…is it only for the college environment then? Ah, pardon me. I’m so used to hearing the word “caregivers” that it’s kind of rolled parents into it. It was also intended for parents. My dad has a Mark, and he’ll wear it occasionally. Some parents seem to feel extremely insecure about interactions w adult autistics already..
Is that so? That’s news to me. I guess most people don’t notice because I have relatively mild Asperger’s. A lot of it comes from when I was doing talks at conferences. I heard an awful lot of the term “caregivers”, and I guess it stuck. I’ll have to check the materials I produced for it and make sure that parents are included. Love the infinity symbol – infinite variations, infinite possibilities. I like being associated with rainbows as we embrace diversity. I am one of those parents with a puzzle piece tattoo and I don’t think anyone could say that I feel there is a piece of my son missing. I have it to start a conversation. To me it represents that is only a piece of the whole that is my son, a tiny piece most of the time but important nonetheless as he wouldn’t be his whole self without it. I have yet to meet anyone – besides my daughter who has one too and requested we get them together for her birthday present to celebrate the love for her brother – with the same tattoo. 🙂 that’s so nice that your daughter has it too ! See, I do think,too, that the puzzle piece is very established and it does certainly not mean the same to everyone – and starting and having conversations about autism is certainly a great result from having the puzzle tattoo..! You know I love your blog for its authenticity and humour. And how much you love your son seeps through it in every post about him. I generally use the rainbow infinity loop, as it seemed to me to be the most widely known neurodiversity symbol. This is the symbol generally used by The Unpuzzled Project. 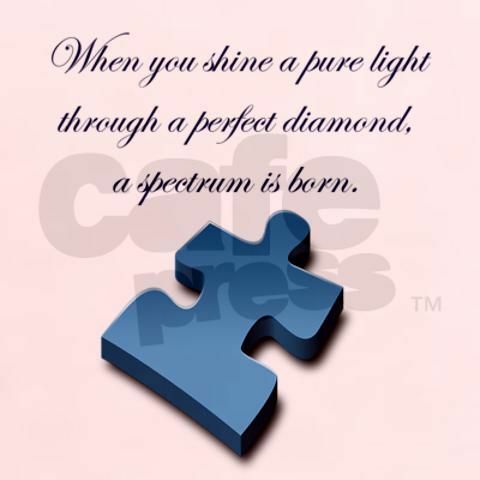 Alternatives I sometimes use include a brain or a rainbow brain, however I have also heard of people using the color orange to oppose the light blue puzzle pieces of Autism Speaks. this is all very interesting. thanks for visiting my blog ! If there has to be a symbol, which is certainly not a requirement, I kinda like the idea of a snowflake. Individually unique, precise and patterned, lovely but delicate, exists optimally in only a suitable environment that supports their form and function… At least, that is reminiscent of my daughter to me. I’d still like a tattoo version of the shine pure light through a perfect diamond, a spectrum is born” quote. snowflake! yeah, that’s a nice symbol but I also see that as a great symbol for neurodiversity really.. =) what’s that quote/diamond thing? do you have a link to a picture? great points I’ve never really paid any mind to it before. But honestly I can see how upsetting it would be. 🙂 thanks for sharing. Rainbow brain!! I like the idea. I feel the neurodiversity symbols are indeed more inclusive than a symbol ‘just’ for autism.. Absolutely! I love the comic. It’s a great share! The infinity loop is old school, I think. When I first started looking around for an alternative to the puzzle piece, I liked it because instead of a ribbon it was infinity! I’ve also seen some rainbow Mobius strips, but the execution didn’t please me. I also like the rainbow brain. I might fiddle with it some and post an image here for you! Oh yes please. I have seen a few more things now..But it seems that some go for a symbol for neurodiversity (which in the end is more inclusive..) where others do want to show explicitly their pride and acceptance of autism (their own or their kids). I don’t think this sort of phenomenon or conflicts even exists with any other condition.. This is a great comic though! You’ve really captured the issues with the puzzle piece. i have now googled ‘rainbow infinity symbol’ and have to agree with you. a bit like the puzzle ribbon, the complexity of the design can make it look somewhat murky in the end.. Mind if I reblog? This about the puzzle piece has opened my eyes quite a bit. No problem 🙂 this blog is a bit in sleep mode but I still stand for my thoughts back then.